The readings of today’s Mass invite us to consider the growth of the Church in America as one chapter in the greater story of the Church’s expansion following the descent of the Holy Spirit at Pentecost. In those readings we see the inseparable link between the risen Lord, the gift of the Spirit for the forgiveness of sins, and the mystery of the Church. Christ established his Church on the foundation of the Apostles (cf. Rev 21:14) as a visible, structured community which is at the same time a spiritual communion, a mystical body enlivened by the Spirit’s manifold gifts, and the sacrament of salvation for all humanity (cf. Lumen Gentium, 8). In every time and place, the Church is called to grow in unity through constant conversion to Christ, whose saving work is proclaimed by the Successors of the Apostles and celebrated in the sacraments. This unity, in turn, gives rise to an unceasing missionary outreach, as the Spirit spurs believers to proclaim “the great works of God” and to invite all people to enter the community of those saved by the blood of Christ and granted new life in his Spirit. I pray, then, that this significant anniversary in the life of the Church in the United States, and the presence of the Successor of Peter in your midst, will be an occasion for all Catholics to reaffirm their unity in the apostolic faith, to offer their contemporaries a convincing account of the hope which inspires them (cf. 1 Pet 3:15), and to be renewed in missionary zeal for the extension of God’s Kingdom. “Lord, send out your Spirit, and renew the face of the earth!” (cf. Ps 104:30). The words of today’s Responsorial Psalm are a prayer which rises up from the heart of the Church in every time and place. They remind us that the Holy Spirit has been poured out as the first fruits of a new creation, “new heavens and a new earth” (cf. 2 Pet 3:13; Rev 21:1), in which God’s peace will reign and the human family will be reconciled in justice and love. We have heard Saint Paul tell us that all creation is even now “groaning” in expectation of that true freedom which is God’s gift to his children (Rom 8:21-22), a freedom which enables us to live in conformity to his will. Today let us pray fervently that the Church in America will be renewed in that same Spirit, and sustained in her mission of proclaiming the Gospel to a world that longs for genuine freedom (cf. Jn 8:32), authentic happiness, and the fulfillment of its deepest aspirations! Dear friends, my visit to the United States is meant to be a witness to “Christ our Hope”. Americans have always been a people of hope: your ancestors came to this country with the expectation of finding new freedom and opportunity, while the vastness of the unexplored wilderness inspired in them the hope of being able to start completely anew, building a new nation on new foundations. To be sure, this promise was not experienced by all the inhabitants of this land; one thinks of the injustices endured by the native American peoples and by those brought here forcibly from Africa as slaves. Yet hope, hope for the future, is very much a part of the American character. And the Christian virtue of hope – the hope poured into our hearts by the Holy Spirit, the hope which supernaturally purifies and corrects our aspirations by focusing them on the Lord and his saving plan – that hope has also marked, and continues to mark, the life of the Catholic community in this country. Saint Paul speaks, as we heard in the second reading, of a kind of prayer which arises from the depths of our hearts in sighs too deep for words, in “groanings” (Rom 8:26) inspired by the Spirit. This is a prayer which yearns, in the midst of chastisement, for the fulfillment of God’s promises. It is a prayer of unfailing hope, but also one of patient endurance and, often, accompanied by suffering for the truth. Through this prayer, we share in the mystery of Christ’s own weakness and suffering, while trusting firmly in the victory of his Cross. With this prayer, may the Church in America embrace ever more fully the way of conversion and fidelity to the demands of the Gospel. And may all Catholics experience the consolation of hope, and the Spirit’s gifts of joy and strength. “In hope we were saved!” (Rom 8:24).” As the Church in the United States gives thanks for the blessings of the past two hundred years, I invite you, your families, and every parish and religious community, to trust in the power of grace to create a future of promise for God’s people in this country. I ask you, in the Lord Jesus, to set aside all division and to work with joy to prepare a way for him, in fidelity to his word and in constant conversion to his will. Above all, I urge you to continue to be a leaven of evangelical hope in American society, striving to bring the light and truth of the Gospel to the task of building an ever more just and free world for generations yet to come. Those who have hope must live different lives! (cf. Spe Salvi, 2). By your prayers, by the witness of your faith, by the fruitfulness of your charity, may you point the way towards that vast horizon of hope which God is even now opening up to his Church, and indeed to all humanity: the vision of a world reconciled and renewed in Christ Jesus, our Savior. To him be all honor and glory, now and forever. Amen! 10:00 a.m. – The pope will offer Mass at the new Nationals Park in Washington. 5 p.m. – Pope Benedict XVI will give an address on the importance of Catholic education on the campus of The Catholic University of America. 6:30 p.m. – Buddhists, Muslims, Hindus, Jews and representatives of other religions will meet the Holy Father at the Pope John Paul II Cultural Center, next door to Catholic University. In this regard, a matter of deep concern to us all is the state of the family within society. Indeed, Cardinal George mentioned earlier that you have included the strengthening of marriage and family life among the priorities for your attention over the next few years. In this year’s World Day of Peace Message I spoke of the essential contribution that healthy family life makes to peace within and between nations. In the family home we experience “some of the fundamental elements of peace: justice and love between brothers and sisters, the role of authority expressed by parents, loving concern for the members who are weaker because of youth, sickness or old age, mutual help in the necessities of life, readiness to accept others and, if necessary, to forgive them” (no. 3). The family is also the primary place for evangelization, for passing on the faith, for helping young people to appreciate the importance of religious practice and Sunday observance. How can we not be dismayed as we observe the sharp decline of the family as a basic element of Church and society? Divorce and infidelity have increased, and many young men and women are choosing to postpone marriage or to forego it altogether. To some young Catholics, the sacramental bond of marriage seems scarcely distinguishable from a civil bond, or even a purely informal and open-ended arrangement to live with another person. Hence we have an alarming decrease in the number of Catholic marriages in the United States together with an increase in cohabitation, in which the Christ-like mutual self-giving of spouses, sealed by a public promise to live out the demands of an indissoluble lifelong commitment, is simply absent. In such circumstances, children are denied the secure environment that they need in order truly to flourish as human beings, and society is denied the stable building blocks which it requires if the cohesion and moral focus of the community are to be maintained. As my predecessor, Pope John Paul II taught, “The person principally responsible in the Diocese for the pastoral care of the family is the Bishop … he must devote to it personal interest, care, time, personnel and resources, but above all personal support for the families and for all those who … assist him in the pastoral care of the family” (Familiaris Consortio, 73). It is your task to proclaim boldly the arguments from faith and reason in favor of the institution of marriage, understood as a lifelong commitment between a man and a woman, open to the transmission of life. This message should resonate with people today, because it is essentially an unconditional and unreserved “yes” to life, a “yes” to love, and a “yes” to the aspirations at the heart of our common humanity, as we strive to fulfill our deep yearning for intimacy with others and with the Lord. Priests, too, need your guidance and closeness during this difficult time. They have experienced shame over what has occurred, and there are those who feel they have lost some of the trust and esteem they once enjoyed. Not a few are experiencing a closeness to Christ in his Passion as they struggle to come to terms with the consequences of the crisis. The Bishop, as father, brother and friend of his priests, can help them to draw spiritual fruit from this union with Christ by making them aware of the Lord’s consoling presence in the midst of their suffering, and by encouraging them to walk with the Lord along the path of hope (cf. Spe Salvi, 39). 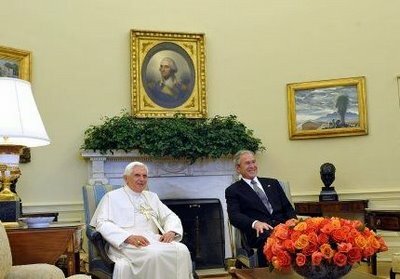 As Pope John Paul II observed six years ago, “we must be confident that this time of trial will bring a purification of the entire Catholic community”, leading to “a holier priesthood, a holier episcopate and a holier Church” (Address to the Cardinals of the United States, 23 April 2002, 4). There are many signs that, during the intervening period, such purification has indeed been taking place. Christ’s abiding presence in the midst of our suffering is gradually transforming our darkness into light: all things are indeed being made new in Christ Jesus our hope. Time spent in prayer is never wasted, however urgent the duties that press upon us from every side. Adoration of Christ our Lord in the Blessed Sacrament prolongs and intensifies the union with him that is established through the Eucharistic celebration (cf. Sacramentum Caritatis, 66). Contemplation of the mysteries of the Rosary releases all their saving power and it conforms, unites and consecrates us to Jesus Christ (cf. Rosarium Virginis Mariae, 11, 15). Fidelity to the Liturgy of the Hours ensures that the whole of our day is sanctified and it continually reminds us of the need to remain focused on doing God’s work, however many pressures and distractions may arise from the task at hand. Thus our devotion helps us to speak and act in persona Christi, to teach, govern and sanctify the faithful in the name of Jesus, to bring his reconciliation, his healing and his love to all his beloved brothers and sisters. This radical configuration to Christ, the Good Shepherd, lies at the heart of our pastoral ministry, and if we open ourselves through prayer to the power of the Spirit, he will give us the gifts we need to carry out our daunting task, so that we need never “be anxious how to speak or what to say” (Mt 10:19). As I conclude my words to you this evening, I commend the Church in your country most particularly to the maternal care and intercession of Mary Immaculate, Patroness of the United States. May she who carried within her womb the hope of all the nations intercede for the people of this country, so that all may be made new in Jesus Christ her Son. My dear Brother Bishops, I assure each of you here present of my deep friendship and my participation in your pastoral concerns. To all of you, and to your clergy, religious and lay faithful, I cordially impart my Apostolic Blessing as a pledge of joy and peace in the Risen Lord.